After waves of popular protests flooding the streets of Algiers, Oran or Constantine, demanding the resignation of president Bouteflika and his clique, the former president seems to have finally given in to the pressure of his “people”. “There won’t be a fifth mandate and this has never been a question for me, my state of health and my age mean that my final duty to the Algerian people can only be to have contributed to laying the foundations of a new Republic as the framework for a the new Algerian system which we all want” (Bouteflika’s message to the nation, broadcast by the media on 11.3.19). The media tell us that this is the first step of the people’s victory, of a new democratic project. But while the crowds cried victory, the outgoing president announced that “there won’t be a presidential election on 18 April. It was a question of satisfying a demand which so many of you have addressed to me”. This declaration provoked further popular anger. For the Algerian population, this departure was seen clearly as a fake departure, a contortion by Bouteflika and his clique to prolong its mandate without having to go through fresh elections. What a farce! In the demonstrations you could hear people saying things like “the people must be sovereign, it must decide its destiny, its future, and its president”; “with the departure of Bouteflika, we can have new political parties which can give us a new Algeria”. These crowds of young people, precarious or unemployed, students and school pupils who headed the demonstrations, bringing whole families out with them, along with all kinds of social categories, small shop keepers and entrepreneurs, functionaries etc, have been mobilising in their thousands since 22 February against Bouteflika’s candidature for a fifth turn in office, denouncing his corrupt system. Bouteflika’s discredit among the population is so strong that no one believed his speeches about resigning. Massive demonstrations have continued to demand the end of the “Boutef” system and the establishment of “true democracy”. The working class in Algeria should not believe in fairytales. Whatever clique is in power, it will remain an exploited class. In this “popular” national unity that aims to chase out this hated clique of leaders, the proletariat is totally drowned in the “Algerian people”, among “progressive” sectors of the bourgeoisie, the petty bourgeoisie, intellectuals and all kinds of nationalist “democrats”. The terrain of defending bourgeois democracy, the nationalist terrain of aspirations for a “new Algeria”, is not the terrain of the working class. To defend bourgeois democracy and its electoral circus, to aspire to the renovation of the Algerian nation, is to abandon the struggle against exploitation. It’s always the ruling class that wins elections! Whichever faction is in power, all governments, all heads of state in all countries of the world have only one function: to manage the national capital, to defend the interests and preserve the privileges of the bourgeoisie on the backs of the working class. No doubt the Bouteflika clan has shown itself to be particularly arrogant and contemptuous, ostentatiously piling up its riches while the great part of the population lives in frightful poverty. But you only have to look at what happens in “pluralist democracy’, where governments of left and right perpetually succeed each other: the working class is subjected to the same exploitation, to unemployment, the degradation of living and working conditions, attacks on wages that get worse year after year. The proletarians of Algeria must not be taken in by the siren songs of the trade unions who call on them to join up with the popular protests by organising a general strike. A strike not against poverty and exploitation, against the deterioration of living standards, but to replace Bouteflika with a “good” head of state who cares about the needs of the “people” and wants to build a “new Algeria” for all classes. All these lying parties, these “saviours from on high”, these trade unions who specialize in sabotaging the class struggle, all of them promise the exploited in Algeria a more democratic, more prosperous Algeria at a time when the entire capitalist world is plunging into an economic crisis which is hitting the world working class very hard. The proletariat of Algeria knows what it means to fight against exploitation. In the past, it has organised strikes in different sectors, it has faced up to the repression handed out by the Bouteflika clique. It should have no illusions: tomorrow, even if Bouteflika goes, the same repression will descend of the working class if it dares to defend its own interests - a repression under the command of a “new look”, democratically elected government. In Algeria, as in the whole capitalist world, the proletariat has to reject the mystification of bourgeois elections and the poison of nationalism. Bouteflika, this senile potentate, is just a personification of a senile world capitalist system which has nothing to offer the exploited except more poverty and more repression. In Algeria, as in all countries, there is only one alternative: the autonomous struggle of the proletariat against its exploiters! 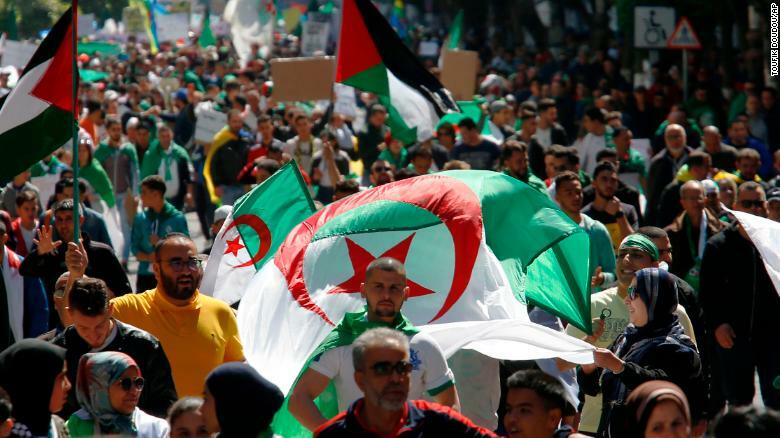 Since this article was written, fresh demonstrations broke out in early April when it became clear that Bouteflika would merely step aside for another well-known figure in the old clan, Abdelkader Bensalah, supposedly an interim leader for a maximum of 90 days until an election. The military hierarchy, with whom the reigning clique is intimately linked, will not of course be seeking re-election. The demonstrations raised the apparently radical slogan “get them all out”, but this is aimed not at the bourgeoisie as a ruling class, but at a particular clique within the bourgeoisie. The proletariat will only be able to “get them all out” when it breaks through the chains of democracy and the nation.